Of this small family, one species, Homadaula anisocentra (Figs. 1, 2), occurs in Illinois. It was placed in Plutellidae in the 1983 checklist, but it does not belong there, nor anywhere else in the Superfamily Yponomeutoidea. No firm consensus has been reached on the position of Galacticidae within Lepidoptera. Its whilom affiliation with Yponomeutoidea stemmed from the fact that, at least in H. anisocentra, the leaf-feeding larvae occur communally in webs, and the forewing of the adult moth is adorned with numerous small black spots, one or both of which features are seen in many species of yponomeutoid moths. These similarities are, however, coincidental, and the morphological structure of H. anisocentra--most particularly, the presence of tortricoid apodemes on the second (apparent first) abdominal sternum of the adult (Fig. 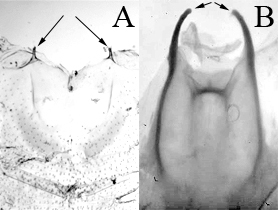 1A), in contrast to the tineoid apodemes seen in all Yponomeutoidea (Fig. 1B)--clearly argues that H. anisocentra must be excluded from Yponomeutoidea. Homadaula anisocentra is native to Japan and China and was introduced into the USA from the latter country in the early 1940s. The larva of H. anisocentra is called the mimosa webworm, as it feeds on leaves of leguminous trees (i.e., trees belonging to the family Fabaceae), including mimosa, Albizia julibrissin. In Illinois, it feeds on honey locust, Gleditsia triacanthos. There are two generations per year, with overwintering in the pupal stage. By the third week of August, the larval feeding damage, which consists of webbing and browning of leaves, is usually extensive and very conspicuous, owing to the large number of larvae that are present at that time. Sometimes large expanses of foliage, and even entire trees, are rendered almost completely brown in appearance. Damage done by this species in Illinois was illustrated by English (1976). After the larva finishes feeding, it spins, and pupates inside, a dense, multilayered cocoon that is superficially reminiscent of the cocoon seen in Choreutidae (cocoon is shown in right-hand panel of the linked image). Figure 1. Second (apparent first) abdominal sternum; A, Homadaula anisocentra, showing tortricoid (short, conical) apodemes (at arrows) of the type seen in all "apoditrysian" moth groups, including Galacticidae; B, Zelleria celastrusella (Yponomeutidae), showing tineoid (long, solid, rodlike) apodemes of the type seen in all "sub-apoditrysian" groups of Ditrysia, including Yponomeutoidea. Also note the absence in H. anisocentra (and presence in Z. celastrusella) of a transverse sclerotized bar near the anterior margin of sternum 2, which likewise is a requisite feature for Yponomeutoidea. Figure 2. Homadaula anisocentra. 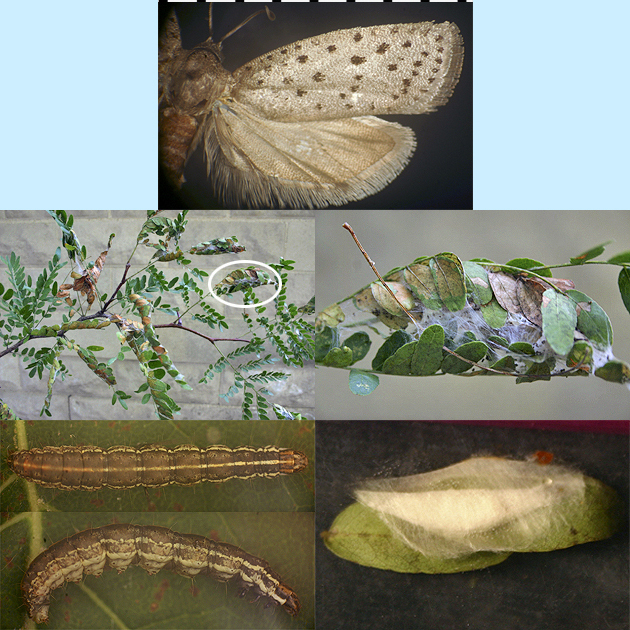 Top: adult; middle: left, larval damage on honey locust, Gleditsia triacanthos (Fabaceae); right, closeup of the circled area in the left-hand panel; bottom: left, dorsal (upper panel) and right-lateral (lower panel) views of the mature larva; right, cocoon.